I wrote this post today inspired by catching up with an old friend on the weekend with whom I used to have the grandest adventures. 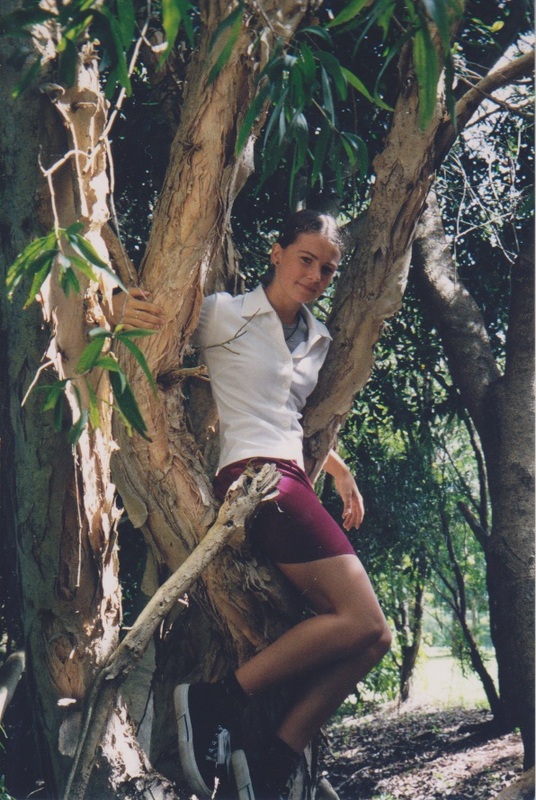 Me up a tree in my school uniform, because that was 50% of my school life. I grew up with a great attitude. In primary school I was a tom boy, and just didn’t care about much but climbing trees, playing soccer and reading. I loved to climb camphor laurels and mango trees and read up in the branches until I was too sore to sit up there any longer. I had a patch in early high school where I was teased(who hasn’t? ), but then it clicked in my head that I didn’t actually care about those twits who called me names and I did as I pleased. I’m so grateful for that, because it means I have never stunted my imagination. My best friend and I would run about our forests (we each lived on farms which had plenty of forest and swamp and creeks in them) and have adventures. Yes, like little kids. We quested for treasure, fled from monsters (that were actually pets just chasing us for affection), had sword fights and hunted the Tuckean Swamp monster late at night. I will never deny those things. OK, by some people’s view 17 is a little old to be hunting a monster on the back of your friend’s farm, but you know what? I never stifled my imagination. I let myself play. I let myself believe. I let myself live without letting peer pressure change who I was and wanted to be. And this is who I am today. I hope I can pass this on to my son. I think it’s great you still did these things when you were 17! I hope you still do them when you’re 47 🙂 It’s so easy to end up genericizing yourself. I’ll be 77 and still going on adventures (providing Xander gives me some grandchildren by then ;p ). I roleplayed with my cousin and sister until about that age, and played elaborate stories with my sister and our Barbies until I was about sixteen. I think imagination and play are good, healthy signs. I’ll admit it: I even kind of talk out loud to my Sims when I play, haha. Ditto! Writing is a great career for those who never want to stop playing and imagining.